The French Riviera is a worldwide renowned destination, and thanks to winter packages, golfers can experience it for themselves when staying at the striking Royal Mougins Golf Resort near Cannes. Famous for the Cannes international film festival, luxury shops, designer boutiques, beaches and opulent nightlife, the region also boasts some outstanding golf courses including Royal Mougins - the French Riviera's only golf resort and named as France's ‘Best Golf Hotel' for the last three years at the World Golf Awards. Situated just four miles from Cannes, the resort offers first-class facilities on and off the course and players can take full advantage this winter and spring, with one night's bed-and-breakfast including golf available from €165 per person. Bookable until April 19, 2019, the breaks feature 18 holes (including buggy) on the award-winning venue's championship course - designed by acclaimed architect Robert Von Hagge and a four-time host of the European Tour's Cannes Open - and an array of other attractive benefits. These include unlimited use of the golf practice area, a free club-cleaning service and access to the resort's new concierge service and luxurious Royal Spa offering facilities including a sauna, steam room, outdoor swimming pool, fitness centre and a range of treatments (not included in price). Accommodation is provided in a spacious suite in Royal Mougins' exclusive hotel while all packages, which are based on two people sharing, also include VAT. 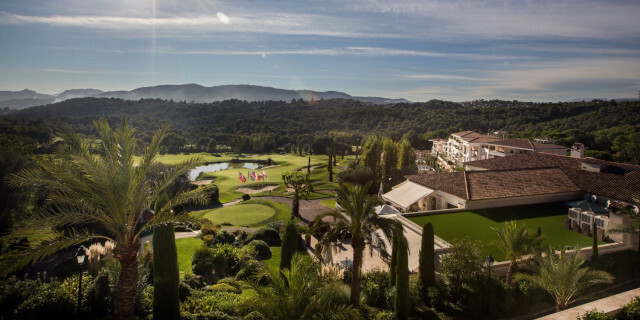 Royal Mougins has established itself as one of France's premier golfing venues over the last decade, and helped to set the standard for European golf resorts thanks to the quality of its course, the pristine nature of its setting, and its top-of-the range services. Laid out in a wooded vale, Royal Mougins' championship course winds its way around scenic wooded vales, rivers and lakes - several with picturesque, free-flowing waterfalls. The resort also features the Prime Golf Academy - with a par-three course and performance studio, an exclusive four-star hotel with 29 designer suites, conference facilities, a Mediterranean restaurant ‘La Terrasse du 18' and a 450m2 Royal Spa and fitness centre, situated in an authentic 19th-century stone-walled country house, and a real estate agency. And Royal Mougins' prime location provides guests with the opportunity to explore the many cultural and gastronomic delights of the historic nearby village of Mougins. Just 20 minutes from Nice airport, the town is overflowing with an array of internationally-acclaimed art galleries, museums and Michelin-star restaurants, which are home to some of France's greatest chefs. For more information, visit www.royalmougins.fr.